Theme Park Press Releases: Kennywood Announces Black Widow as New Ride for 2012! Kennywood Announces Black Widow as New Ride for 2012! Something wicked is coming to Kennywood. 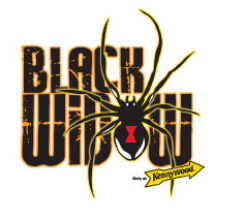 With the start of the summer season a short five months away, Kennywood is proud to announce Black Widow as our newest ride for 2012! Black Widow will stand at 90 feet tall but will reach a height of 146 feet in full swing with an angle of 120 degrees from the center. The pendulum motion propels riders back and forth at 68 miles per hour. While riding Black Widow, guests experience a one of a kind perspective of Lost Kennywood.